This recipe is from two amazing food lovers and fellow bloggers. They believe in bringing food back to basics and that home cooking is the way to go. Amazingly tasty food, without being unhealthy! Grease the inside of the baking dish. Rinse the black beans and leave them to drain. Melt the butter or coconut oil in a saucepan over a gentle heat, then set it aside. Place the drained beans, eggs, cacao powder, 150ml of the maple syrup, the vanilla extract and coffee extract (if using) into a food processor with a pinch of salt. Pulse a few times, then blend until smooth. While the machine is running, add the melted butter or coconut oil very slowly, so as not to cook the eggs. Taste the batter, adding more maple syrup if needed. Stir the chopped walnuts in to the mix, reserving a handful for later. Pour the brownie mix into the prepared baking dish and gently tap on a kitchen counter to even out the mixture. Sprinkle on the remaining walnuts and bake for 40-45 minutes or until the brownie feels firm but springy and its surface has cracked. Leave the brownie to cool completely before cutting it into squares. Refrigerating the brownies makes them amazingly fudgy. 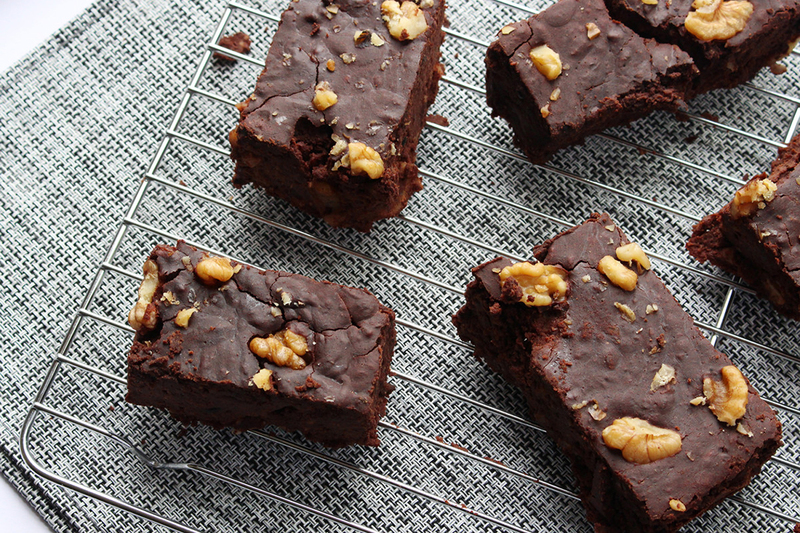 Bake these delicious brownies on an appliance from Leisure. Can’t decide what size for your kitchen? View our collection of 60cm range cookers, 90cm range cookers, 100cm range cookers or 110cm range cookers.